Chapel Time with my sidekick Peter! Well, yeah, kinda. But I was actually going for mommy or baby brother. 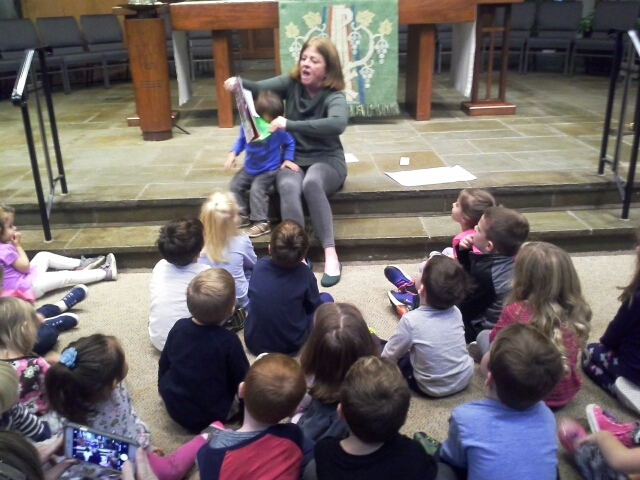 As the giver of the weekly children’s sermon, and as leader of our monthly preschool chapel time, I have learned to be verrrrryyy careful when I solicit responses from my young audiences. Kids, as we know, do say the darnedest things, and some of those darned things can totally derail a message. I know some folks in my position who approach things differently. They get up there and basically just let the children chatter on about whatever, for the duration of “Time for Kids.” And the more the adults laugh, the more the little ones act up. But my issue with that is, this is a great opportunity to actually tell them something about God, and in some cases that opportunity seems wasted. That said, I do really enjoy my time with the small fry in our church and nursery school. It’s fun to come up with Bible stories that they can relate to in some way, and I hope they retain the tale of Joseph and His Brothers, or Daniel and the Lions—at least for a little while. A few months ago, the story was Joshua and the Battle of Jericho. In advance, I made a "wall" of cardboard building blocks. Joshua and his men circled the city (the kids walked around the sanctuary), and on a signal, they all blew kazoos (their "horns"). I stood behind the wall, gave it a nudge, and it all came tumbling down. At other times, I have given out band aids to illustrate the Good Samaritan, shared goldfish crackers for the Feeding of 5000 (perfect! “bread” and “fish” combined!) and counted cotton ball “sheep,” just as our Good Shepherd always keeps an eye on us. Today was Noah’s Ark day. I was talking to the two year old class, which included my Peter. He greeted me with a big hug, then proceeded to sit on my lap—and wouldn’t budge. I struggled to turn the pages of the Story Bible and show the pictures, while holding my squirming assistant. The take-away item was little plastic bags of stick-on animals that the kids could use to make ark drawings later. The teachers collected up the bags so that they could send them home, which was OK by everyone except one tyke. Mine. Peter’s piercing shrieks could be heard all over church, and I kicked myself for handing the bags to the children in the first place—a real rookie mistake. This morning reminded me that, much as I adore being in control of situations, I really never am—God is. And because of that, I believe the kids will remember the core message of every story: God loves them very, very much, and will always be there for them. And if they forget all my bells and whistles, it doesn’t matter a bit.